Pulau Pinang (Penang) is located on the northwest coast of Peninsular Malaysia, by the Strait of Malacca. It is the second smallest state in Malaysia after Perlis but the eighth most populated. It is also a very well connected state with modern infrasturcture and an airport serving much of South East Asia. There are busy routes and frequent cheap flights into Penang , with these being the best mode of access for visitors in any major Malaysian city; or indeed Thailand, Singapore, Hong Kong or China. Penang also boasts a range of beautiful beach resort getaways, many considered amongst the best in South East Asia. The modern name "Penang" is a derivation from the Malay word Pulau Pinang, which means island of the areca nut palm. The state of Penang is referred to as Negeri Pulau Pinang and Penang Island is called Pulau Pinang in Malay. Penang was originally part of the Malay Sultanate of Kedah. In the year 1826, Penang came under the grouping of Straits Settlements administered by the British colonists in India, before coming under direct British rule later in 1867. The capital of Penang state is George Town after Britain's King George III and is located on the northeast corner of Penang Island. Tanjung as it is referred to in Malay was actually built on inhospitable swampy land, but today it is considered among the 10 most liveable cities in Asia and is a big draw for tourism! Recognized as a UNESCO World Heritage Site, Georgetown offers a delightful experience with its authentic old world charm and charisma. There is plenty to explore all over the island. Penang is frequently referred to as "The Pearl of the Orient". Visitors will be awestruck by the magnificent bird’s eye view of the island from Penang Hill, located in the town of Air Itam. One glance from the hill will leave you in little doubt as to why the island was dubbed ‘the pearl’! At 821 metres above sea level, Penang Hill was once upon a time established as a hill for growing strawberries and was referred to as Strawberry Hill by the British. Visitors can enjoy the view while relaxing in its many grand Colonial mansions that have been converted into restaurants and guesthouses, and experience its past grandeur. 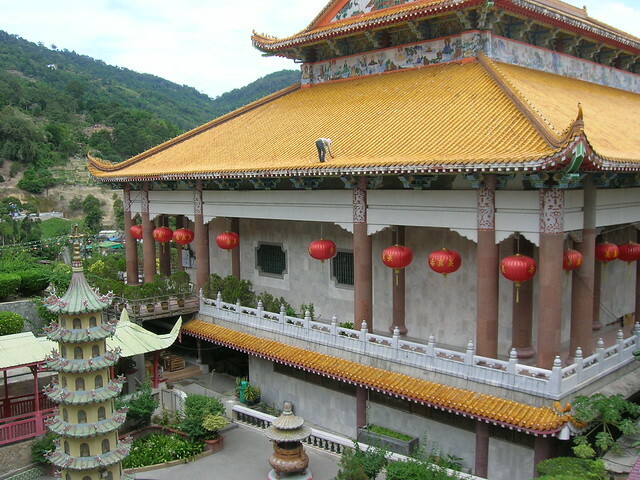 Malaysia’s largest Buddhist temple, Kek Lok Si, overlooks the town. Known as the Temple of Supreme Bliss, this 120-year-old temple is a sight to see during Chinese New Year when it is lit up with thousands of lanterns transforming this popular place of worship into a brightly lit fairyland at night. Nearby Kek Lok Si temple you'll find the Jade Emperor's Pavilion, also just a short distance from Penang's Hill Railway Station in Air Itam. The 140-year-old temple was erected in honor of the Jade Emperor, whom the Taoists believe to be an important figure in the afterlife. The temple is a one of a kind in Malaysia and is thronged by devotees throughout the Chinese New Year festivities who gather on the 9th day of celebrations to pay their respect to the deity 'Thee Kong' on the day of his birthday. Penang is a state where many different cultures live in harmony. It is also home to a small community of Malaysian Thais and Burmese found mostly in the quaint town of Pualu Tikus. Wat Chayamangkalaram, built in the 19th century by a Buddhist monk from Thailand is a popular temple in the town. The reclining Buddha is breathtakingly shiny with its gold plating and spans a full 33 metres in length! The Buddha brings in swathes of devoted followers from round the world, particularly throughout the Thai festivals of Sonkran and Loy Krathong respectively, both of which are celebrated by the Thai community of Penang. The temple grounds offer a gallery of intricately designed shrines as well as many more Buddha statues of various sizes adorned with Dragons and mythical serpents. The Burmese temple, Dhammikarama is situated right opposite. The state is beautiful blend of rich cultural traditions, magnificent heritage and modernity combined with natural wonders. Pantai Acheh is Penang’s prized National Park, and although the most diminutive in the country in terms of land area, it has just as much to offer as its peers! The park has some unique eco-friendly hotspots like the beautifully preserved beach at Pantai Kerachut with a 127 year old operational Lighthouse. There is also a meromictic lake - a spot where there is both seawater and fresh water prevented from mixing. The lake is a peaceful spot ideal for eating lunch and having a swim! Visitors can also engage in fishing and trekking around the park. Boats regularly journey from the beach to neighboring islands too. Penang's Toy Museum is situated in Tanjung Bunga and is believed to hold the biggest collection of the kind the world over! It is also Asia's first and leading toy themed museum. Great for the whole family, the building houses more than 100,000 toys, dolls, full size models and other fun collectibles. This truly is playground for the young at heart and nostalgic! Penang also entices visitors with its scrumptious cuisines. Nestled inside this food capital of Asia is the “Penang Spice Garden”. Penang boasts the distinction of housing South East Asia's only specialist spice garden! With 3.2 hectares of pristine green surroundings, and more than 500 varieties of colorful ferns and flower bearing plants from Malaysia and other regions – this truly is a paradise on earth. The garden is located in Teluk Bahang, and it is a perfect setting to laze away with a drink from its café overlooking the pristine blue sea or shop in its one of a kind “spice boutique”. Penang truly does offer the best of Asia. Its ornate temples and unique sights like the Snake temple and Butterfly farm will engross you. A pleasant stroll down its heritage-rich capital city will relax you. Penang offers a glimpse into a world where nature, tradition and history blend with the colourful heritage of her many races - and the proud “Penangites” are considered to be some of the friendliest locals in the whole nation! Search the widest range of accommodation options and resorts on Penang with MalaysiaExplorer.net's booking partner - also find verified guest reviews™ and image galleries. Tailor all aspects of your holiday or visit to Penang with comprehensive tour and package choices. Read our top tips on car rental to ensure you choose a suitable vehicle at a good price. Our guide to Malaysia flights is packed with advice and pointers on finding the best routes and super deals. Double click the map below to zoom in on Penang, and double right-click to zoom out! Photo Credits: jerine, Ian XYZ, mckaysavage and anjci!